If you’re looking for a new place to hang out in with a fun and chill vibe, then you really ought to check out this joint! Teddy’s Burgers and Tiki Bar gives you a taste of the tropics without leaving the city. Inspired by the surf, the food and the original tiki bars in Hawaii, this burger place and bar introduces the whole Hawaiian experience: colorful interiors, meaty burgers, thick milkshakes and innovative cocktails! 5. It’s one of the CUTEST restaurants in the Metro. 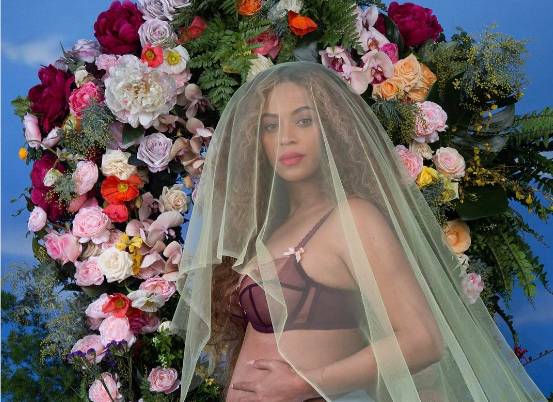 Get your camera phones ready because the ENTIRE restaurant is Instagrammable! The walls are filled with handpicked framed photos from Hawaii, mini surfboards and tiny paddles. The place is also very well lit with many hip and decorative lights that hang from the ceiling. 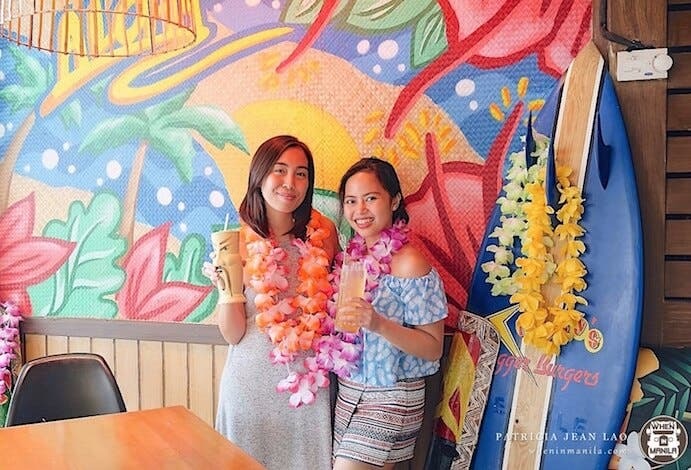 Not to mention, the walls are painted with bright and colorful tiki-inspired designs that serve as lovely backgrounds for your family or barkada photos. Feeling EXTRA? Borrow their flower necklaces to add that Aloha vibe to your group shots! 4. They have the MEATIEST and JUICIEST burgers you’ll ever taste. Teddy’s Burgers + Tiki Bar isn’t called a burger joint for nothing. Just looking at their menu, I already felt my inner Wimpy (the hamburger lover from Popeye) taking over! Teddy’s Burgers is made from 100% USA steak burger patties. They have various burgers to suit any taste palate to the point that my mouth was literally salivating from all the options. They also serve Hawaiian Burgers for those who want some pineapple sweet juices together with the pure US beef patties. They have the Baecon Me Crazy Burgers that are equal parts juicy AND cheesy topped with some crispy bacon strips. What’s life without risks? Teddy’s also has classic Cheese and Western BBQ Burgers that are just so sinful with dripping sauces and flavorful meat. I’m gonna stop talking about the burgers at this point because I don’t want to be responsible for you licking your screen. 3. They’ve got yummy appetisers and super thick milkshakes. Another reason why Teddy’s is definitely a go-to hangout is because of its wide range of Tiki Bar Chow and super thick milkshakes. The appetizers alone can already fill up your tummy! Their servings are absolutely generous! Teddy’s Burgers has numerous of appetizers to choose from. I’m quite sure you’ll find a lot of familiar favorites. They have mozzarella sticks, fish and chips, extreme nachos and even chicken karaage, to name a few! They also have milkshakes that are delicious thirst quenchers ranging from chocolate to oreo to halo-halo! These go perfectly with the burgers and poke bowls that they cook up. 2. You can enjoy HAPPY HOUR with their creative and cute cocktails. Teddy’s Burgers and Tiki Bar is also the perfect spot to cap off your day with friends or officemates. They have the most innovative drinks that come in really cute and silly containers! They have cocktails that are great for sharing, too, such as the Salamanca – a blue rum, peach schnapps and pineapple concoction served in a funny fish bowl. If in Hawaii they say “Aloha!”, here in the Philippines we say, “Mabuhay!” The Mabuhay is the local welcome drink of Teddy’s here in Manila. It’s coconut rum mixed with fresh mango, pineapple and banana liquor served in a cute frog cup! The Tiki Bar also mixes colorful coolers like the Halewa Fresh, Rose Ala Moana, and the Waikiki Wonder. It’s safe to say that ordering all of these refreshing drinks will get you just the right amount of tipsy to have a great time. You’re welcome! 1. You’ll find delicious desserts you know and love. If you’re a dessert lover like me, you might just end up going back to Teddy’s Burgers and Tiki Bar over and over again because they have an amazing Peanut Butter and S’mores skillet. Pure foodgasm. The cold ice cream complements the warm marshmallow s’mores all too well. They also have a delectable Banana Split Overload filled with fresh banana slices, strawberry-vanilla chocolate ice cream and graham streusel. Both kids and adults will definitely enjoy this one! Now, do yourself a favor. Take your friends and family to Teddy’s Burgers and Tiki Bar RIGHT NOW! Realize that you don’t really need to go too far just to have a taste of the fun Hawaiian Tropics. Enjoy!